Designed by Loop.pH, the SOL Dome was inspired by molecular biology and the chemical bonds holding atoms together in a molecule. By combining scientific mechanisms for utilizing renewable energy, the SOL Dome is a piece of architecture that adapts to its environment like a living organism. In order to become animated and responsive, the structure features a circular matrix of solar powered LED floodlights connected to an onsite carbon dioxide sensor that makes them change color. Depending on the amount of carbon in the air, different fibers light up in a timed pattern, creating a kaleidoscope of colors. It embodies kinetic energy, with each fiber shaped into a circle to create a mechanism that allows it to recharge as a battery. The SOL Dome was installed in Saginaw, Michigan in response to CO2 levels. 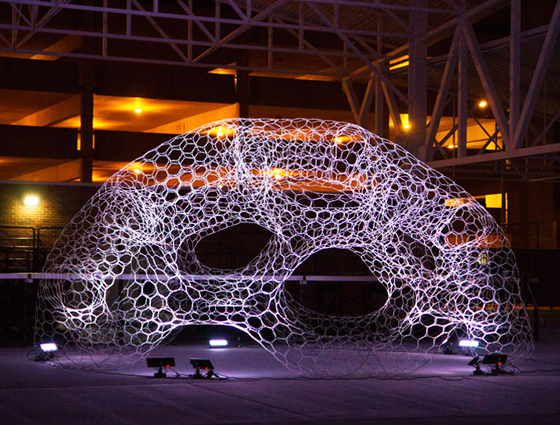 The structure sits at 8meters in diameter, yet weighs less than 100 pounds. The architecture was constructed on site in only three days by a group of local volunteers.